Deep within the tortured aberrations of a monk's mind there lay a concept of a Holy Grail of beer — a beer oft imagined but never tasted, strived for but never achieved. It's Belgian heritage manifested in its yeasty complexity, softened and rounded in its cooperage Français and made to sparkle like the stars first seen by his distant predecessor Dom Pérignon. Bitter Monk Belgian Double IPA is such a beer. 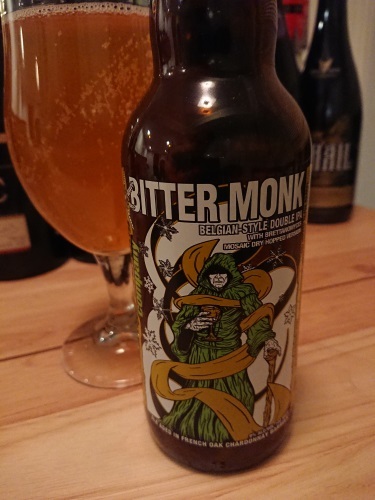 Redolent of citrusy hop bittering and massive malt infusion, this is a beer to ponder, to sip, and, even for a monk, to dream. Why then is the monk so bitter? What provokes that sly smile? What is he wearing under that flowing robe? A triple-fermented beer gives him three times the mystery. Remember, anything worth doing is worth over doing. Nothing exceeds like excess. Even for the cloistered. And what rough monk, his hour come round at last, slinks slowly toward Brussels to be reborn.